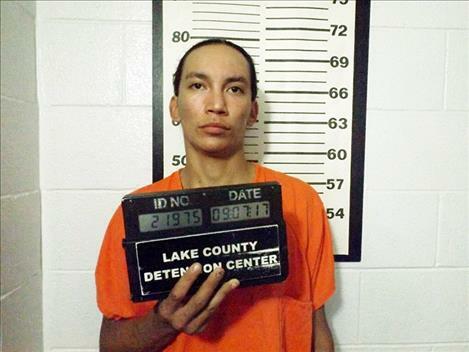 A Ronan man, who was convicted by a Lake County jury on March 6, on charges of robbery, assault with a weapon and criminal endangerment, was sentenced by District Judge James Manley on May 16 to the State Department of Corrections (DOC) for a total of 11 years. Any commitment to the DOC beyond five years likely means prison. According to charging documents, 22-year-old Nathan Mahseelah had gone to a residence on Panchot Avenue in Pablo on Aug. 27, 2017 to retrieve a cell phone and fired three shots from a handgun in an apparent effort to intimidate the occupants. Nearby neighbors reported the shooting saying one bullet passed close by her 12-year-old daughter who was in bed. Another nearby resident reported a bullet came by her son’s head so close it blew his hair. A neighbor was able to a get a license plate number from the vehicle Mahseelah left in. Authorities determined the license plate number came back to a vehicle owned by 42-year-old Angelina Dempsey who was found behind the wheel of the suspected vehicle along with Mahseelah. Demspey is facing charges from the incident as well. Mahseelah was picked up on an outstanding warrant in Polson on Sept. 9, 2017, 13 days after the shooting. He was in possession of methamphetamine. Judge Manley sentenced Mahseelah to the DOC for five years with two years suspended. That sentence will run concurrent to the eleven years.